Orbea rose to prominence over century ago, built from the ground up by the Orbea brothers themselves. Working out of a humble shop set in the pastoral hills of Eibar, Spain, the brothers began their legacy of quality and innovation. After gaining recognition for their adept frame crafting procedures, the once meek town of Eibar grew into the major cycling hub it is today. Their latest OCCAM TR M30 Bike stands as a testament to their quality bike building practices. Featuring a full carbon fiber frame and fast rolling 29" wheels, this bike handles a broad range of trails at a swift pace. 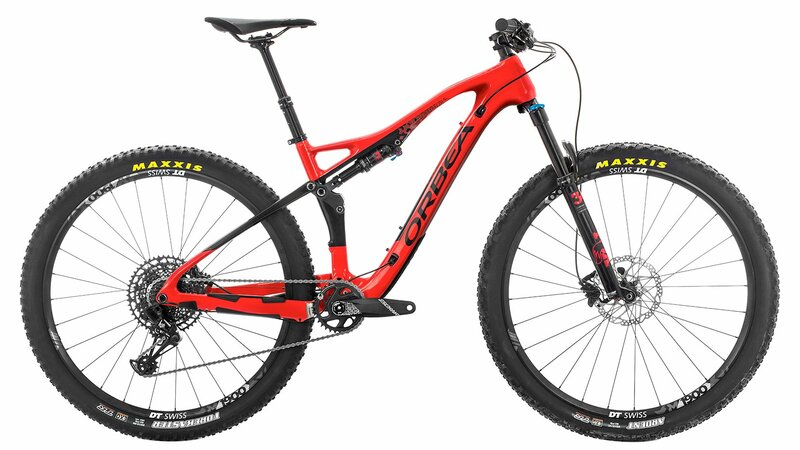 Perfect for everything from All Mountain and Trail ridding to XC or Endurance, Orbea found a real sweet spot with the OCCAM's geometry. With a headtube angle that's steep enough to climb, but still stiff and slack enough to rip through your favorite chutes, the OCCAM is a favorite among serious cross country riders. With the innovative frame design and internal cable routing, this bike looks as swift as it rides. With 130mm of plush travel, courtesy of the Fox Float Performance fork and shock, the OCCAM can effortlessly smooth out your favorite trails. Enjoy 3-position adjustability, letting you ride a range of terrain types. A SRAM NX Eagle drivetrain featuring versatile 1x12 gearing gives you command of steep climbs, sprints, and descents. A Race Face stem and Orbea OC-II Flat bars give you effortless control. DT-Swiss's M-1900 Spline TLR wheels are extra light and stiff for ultimate power transfer. Maxxis Forekaster tires give you a wide base and super-fast rolling speed. The OCCAM TR M30 delivers a riding experience like no other, giving riders the perfect mix of aggressive capability and hard hitting endurance.